The European Space Agency (ESA) recently selected the JUICE mission under its Cosmic Vision programme for 2015-2025. 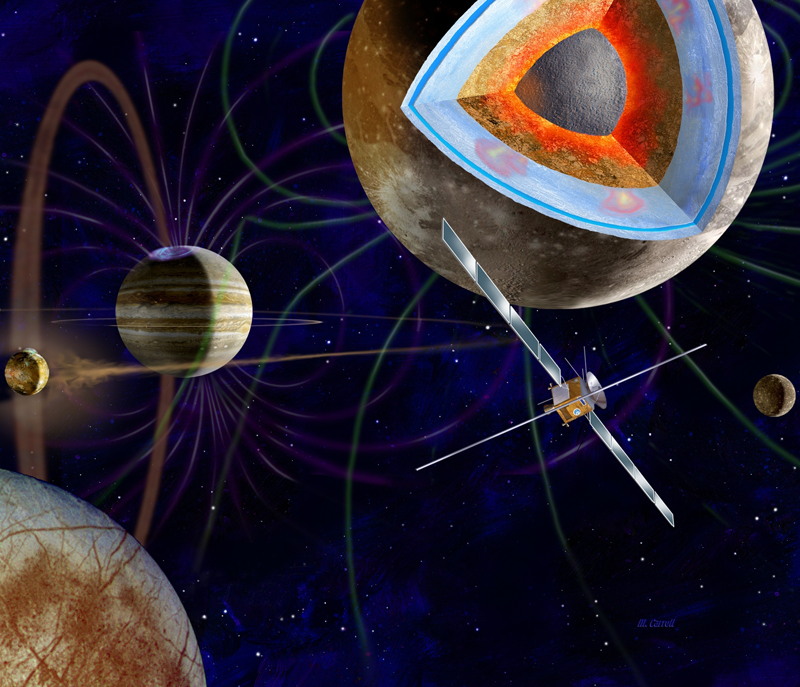 JUICE will reach Jupiter and its icy moons in 2030 and study them for 3 years, focusing in particular on the enigmatic Ganymede. JUICE will be launched from Kourou in 2022. Credits : ESA/AOES. “JUICE is the first entirely European exploration mission to a gas giant planet,” notes Richard Bonneville, CNES’s Assistant Director of Programmes. “An adventure like this only comes around once every 30 years, so it’s great to be a part of it!” admits Olivier Grasset, JUICE Co-Principal Investigator at the LPG planetology and geodynamics laboratory in Nantes1. So where is this mission going? To Jupiter, the largest planet in the solar system. Named JUICE, for JUpiter ICy moons Explorer, it will study Jupiter’s three icy moons, Ganymede, Europa and Callisto. The mission was recently selected for ESA’s Cosmic Vision 2015-2025 programme and CNES will be helping to build the instruments that French research laboratories are going to contribute to the mission. Such precious information will yield new insights into exoplanet systems and the emergence of viable environments around gas giant planets. JUICE is also expected to provide a clearer picture of the ‘ocean planets’ that we are just starting to discover in other planetary systems3. La sonde JUICE atteindra Jupiter en 2030. Crédits : ESA/AOES. Launched from Kourou in 2022, JUICE will reach Jupiter in 2030. 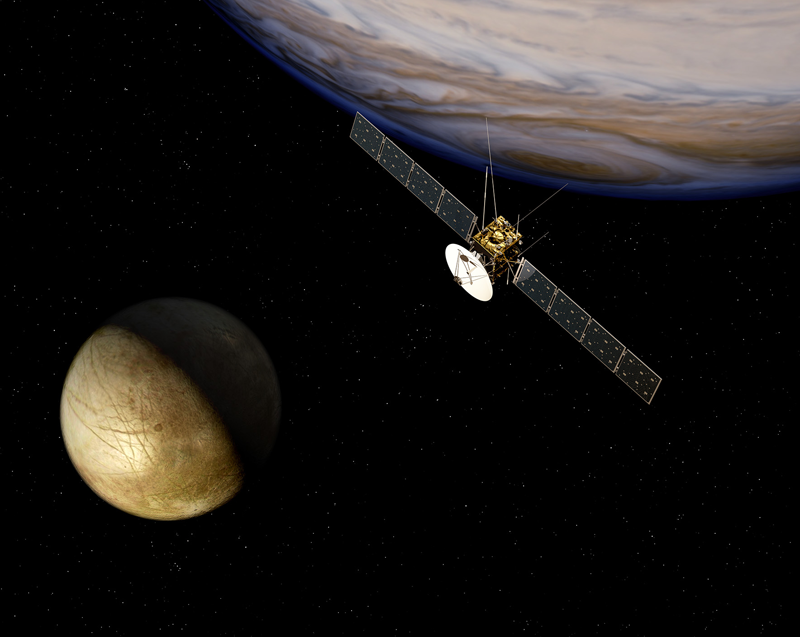 “The mission will be immersed in Jupiter’s magnetic field for 3 years, so it should yield a wealth of data on the Jovian magnetosphere,” says Olivier Grasset. The probe will also analyse the gas giant’s turbulent atmosphere. During its journey, JUICE will fly by Callisto, a moon that is 50% ice. It will also fly by Europa to study the most active areas of its icy crust and identify candidate sites for future in-situ exploration. But the star attraction of the mission is Ganymede, a moon with a radius of 2,600 km, larger than Mercury. “It’s a long-haul mission, so the scientists poring over the data might not be the ones who designed the instruments,” points out Richard Bonneville. “That means we have to ensure a smooth transition between teams. I believe JUICE is set to make history like the Galileo and Cassini-Huygens4 missions before it,” concludes Olivier Grasset. 1 UMR-CNRS 6112, University of Nantes. 2 U.S. space exploration mission to Jupiter and its moons from 1995 to 2003. 3 The discovery of the first ‘ocean planet’ was confirmed in February 2012. 4 Space exploration mission to Saturn and some of its satellites, including Titan, operating since 2004.